November is the month dedicated to counting our blessings. I've been truly blessed with an amazing and loving husband for 53 years. My children are successful in their work and are wonderful parents to my six fabulous granddaughters. My retirement past time is blogging. I love sharing my retirement journey with my family, friends, followers and new visitors. This year has been filled with life lessons. The most important lesson I've learned is to be gentle to myself. As I age I find my energy level has diminished. While decorating my living room mantel in September with fall decor, I decided to decorate with a fall theme and three main elements. Then each month change the accessories to embellish the Holiday for the month. The mantel illustrates the meaning of Thanksgiving. The cornucopia overflowing with fruit, Autumn leaves, bittersweet and caramel candles with a little amber turkey and deer sheds. 'My Little Flowers' vase is transformed with Autumn leaves and bittersweet. The turkeys found my forest in the cloche and decided to stay awhile. I have my mother's McCoy bowl filled with pine cones and some berries. The bowl would be sitting on my mother's dining room table filled with lemons from her lemon tree. My latest most favorite thing is iron on transfers. I bought a 6' x 9' drop cloth at Walmart and made a pillow cover, then ironed on this transfer. The hand carved duck, my inspiration plate and Autumn leaves are added to the basic elements. Three haunted houses are added for Halloween. Simple additions have created three different mantels for three months. Now I have more energy to decorate my Christmas mantel. 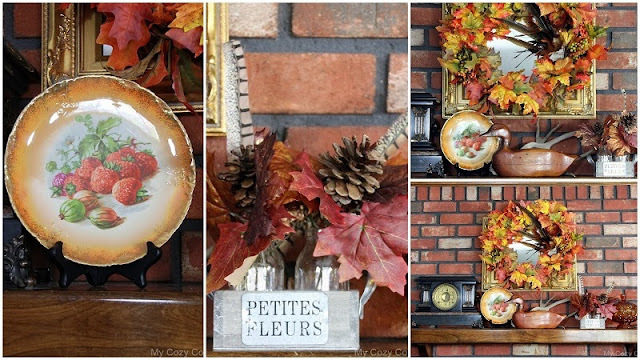 Your autumn decor is lovely and I really like the plate with the leaves in the first photo. The pillow with the iron on transfer is charming. So many beautiful touches of Fall. Beautiful Autumn decor! Your mantel looks beautiful. I love your cute pillow too. Have a happy week! Your Fall decorations are so beautiful. So warm and inviting. The mantle has the perfect fall decorations. 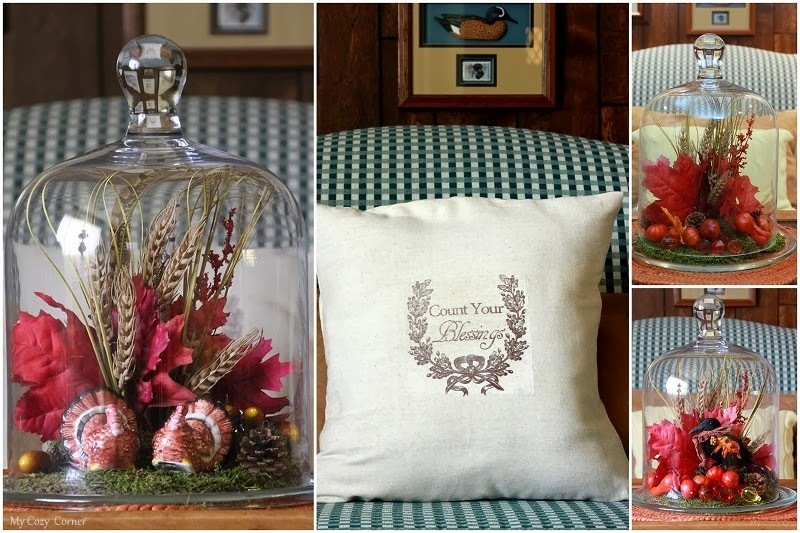 Beautiful décor and I love the memories that you shared that goes with your treasures....Thanks for sharing it! Your decor and designs are just beautiful. I am visiting for the first time and have now become your newest follower. Would love to invite you to follow me back at maddiebellahome.blogspot.com . I look forward to visiting your blog again soon, and look forward to seeing what you will be creating for the holidays. Your fall decor is beautiful. You have done a beautiful job bringing the fall spirit into your home. I understand about slowing down. I can't do half of what I used to do. That being said, I still do twice as much as most of the people I know. I do get tired and I find thinking and learning new things do not come as easy either. I keep telling myself to go slow and steady, to persevere and it all will get done.